Amsterdam’s Jordaan district is well known for its artistic community, so it is fitting that oil painter Urban Larsson, his wife Lara, a painting restorer, and their three children have settled there. 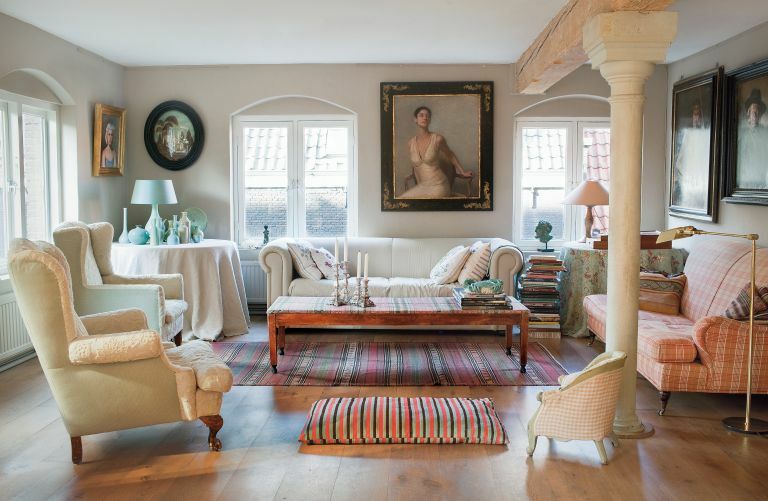 A series of impressive cast-iron columns hint at the previous use of their home – a spacious apartment on the second floor of a converted 19th century factory – as do the rustic oak supporting beams, which the Larssons restored to a natural finish when they moved in. New wide oak floorboards now run the length and breadth of the apartment so that one room flows seamlessly into the next, with rugs used to cosy up spaces where required. The walls are painted in what Urban describes as a ‘beige grey’, which is the perfect backdrop for the family’s quirky mix of furniture and furnishings. ‘I hate white walls,’ he says. ‘This is a nice colour because it can be both cool and warm, depending on the time of year and how the light catches it.’ The kitchen was given to the Larsson family by a friend who was selling her house in the city. ‘She said, “Why don’t you take the kitchen – maybe in the future you will find a house for it,”’ recalls Urban. A restricted budget also meant that Urban and Lara couldn’t carry out all of the renovations on their wishlist, but they still worked hard to turn their apartment into a comfortable family home. What started out as Lara’s restoration studio is now a stunning guest room complete with a sofa bed and cupboards designed by the couple. ‘My wife now has a wonderful studio in an apartment in the same block,’ says Urban. There are playful touches, too, including a globe mobile in the living room, which came from Charleston in South Carolina, where Urban exhibited many years ago. It’s a masterful mix of objects, and proof that a personal style often means simply living with what you love.